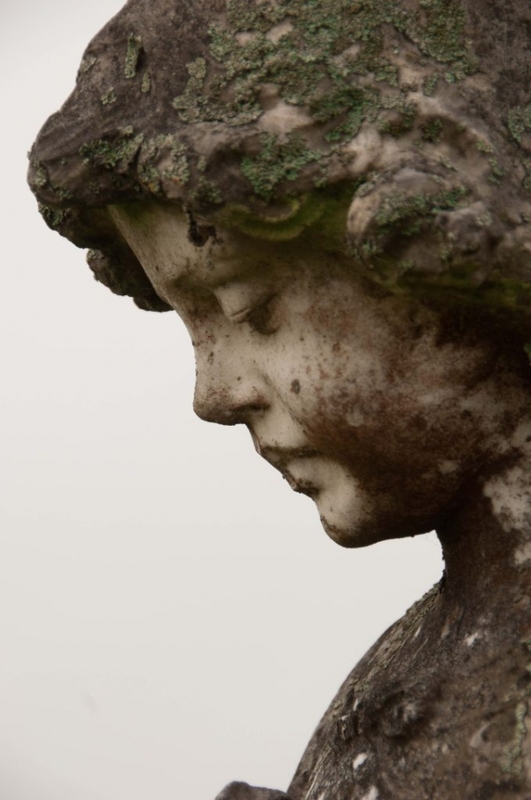 Cemeteries are a link to our past – they are full of history and stories of real people. There are approximately 50,000+ cemeteries in Texas.  These range from a single unmarked grave marker to very large cemeteries with hundreds of marker. Many are forgotten and difficult to find but each are reminders of early settlements and a a window to a lot of Texas history. The HTC (Historic Texas Cemetery) Designation was established in 1998 with the purpose to preserve these historical sites. 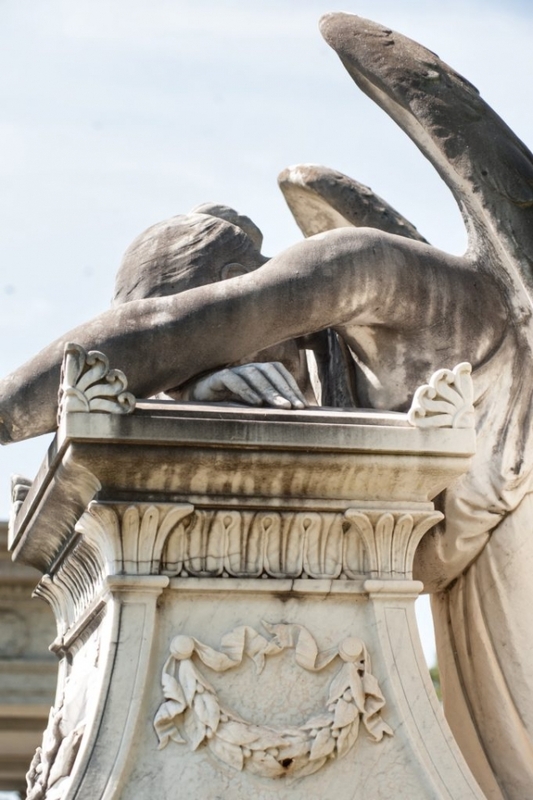 To be eligible for a HTC designation a cemetery must be at least 50 years old and deemed worthy because of historical value – which is every cemetery. In early times when cemeteries did not exist people were buried in plots near their family homes. To keep the dead from rising stones, rocks, and wood were used to mark the bury plot. Eventually church cemeteries began to appear with simple markers with the deceased’s name, age, and year of birth. In the 19th century public cemeteries appeared along with more elaborate headstone and monuments that memorized the dead. Scattered throughout the backroads of Texas are familiar green signs that designate to turn left or right to visit a cemetery. When I see these these sign I turn without even giving it a second thought……why…..because I know that this path, that I am about to wander down, is going to possible lead to a ghost town, many photo opportunities, and most of all a hidden TEXAS TREASURE: Cemetery Art. Over the years I have visited hundreds of tucked away cemeteries. Each is unique and reveals it’s own story. Wondering many times who were these people that once lived near the ground that I was standing on…..what was the story of the man whose marker read “a man that wondered into town and was shot”. What happened to the infant whose marker said simply “baby”. Why a Dad, Mom, and several children passed on the same day. Even one time being shocked to see a stone that said David Norris, kind of creepy. 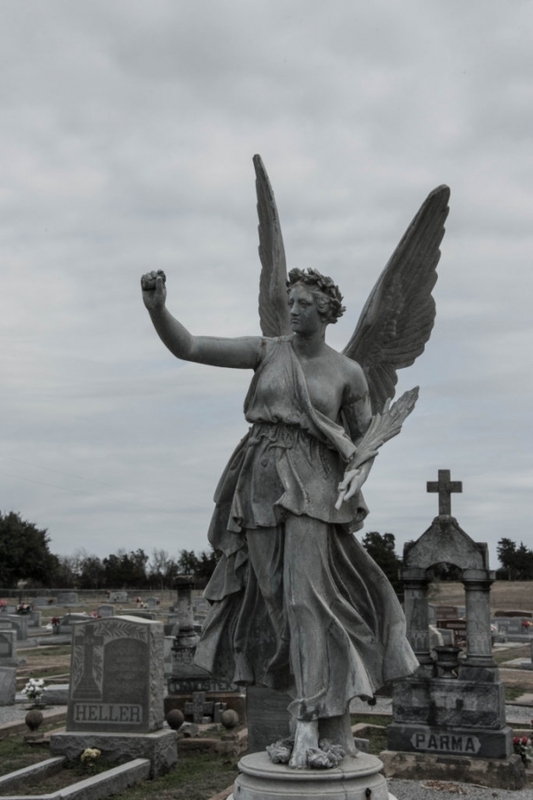 Another reason to visit these sites to spend time capturing the beautiful art that these historic cemeteries provide. The many angels with such expressive faces that creative so many emotions. The inscriptions sharing feelings from so many years ago. Often I will share my “habit” of wandering through historic cemeteries with my camera only to be met with “eyes rolling” and faces that say “what the heck is wrong with you”. I assure you that I will be turning down the dirt road pointed out by one of those green sign, with abundant anticipation, and of course with my camera in hand! This area was first settled in the early 1800’s. 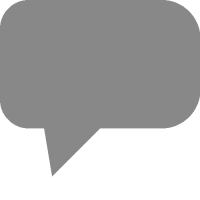 A post office was established in 1860 was then closed in 1867 and finally reopened in 1871. By 1874 the town had eight businesses, including a cotton gin. Most of the residents of the area raised cattle and cotton. The city Hico, Texas was incorporated in 1883. Hico soon became the shipping center for Hamilton County and a center for cotton and cattle markets. Billy the Kid: “Brushy Bill” Roberts, a resident of Hico during the 1940’s claimed to have been the famous outlaw, Bill the Kid. Brushing said he was born south of Abilene in Buffalo Gap. He spent his last years of his life trying to prove to everyone his true identity and obtaining a pardon that was promised to him by Lew Wallace, the Governor of New Mexico. Brushy Bill died in Hico on December 27th, 1950. The son and other decedents of Sheriff Pat Garrett claimed Garrett had not killed Billy the Kid. There were no eye witnesses as to whose body was placed in the Billy’s grave. They believe that Garrett and Billy the Kid plotted to collect the $500.00 reward offered for the capture of Billy the Kid. Blue Star Trading Company – very large retail/event space featuring Texas art and western wear and furnishings. Upstairs is a gallery of historic photographs of Hico. In the early 1860’s during the European immigration several families of Austrian and German descent settled in High Hill. They were searching for religious freedom and opportunities in the new world – they were some of the lucky ones that settled in THE LONE STAR STATE! Life was not easy for these early Texans.. they had travel to nearby cities to celebrate mass and important church holidays. In I869 construction for the first church using lumber that was hauled there from Columbus, Texas by ox-wagons. 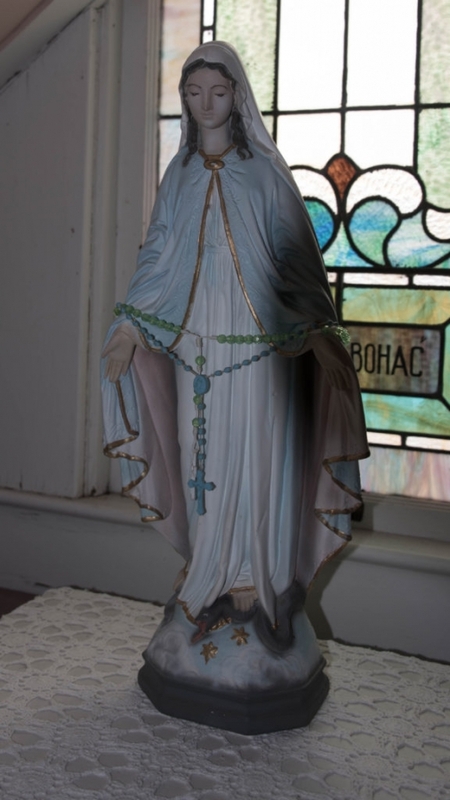 On September 8, 1870 the first Catholic church of High Hill was blessed. As the community grew the second church of High Hill was completed in 1875. The first church building was converted to a school that stayed open until 1922. The St Mary Church of today is the third church to be built on the original nine acres that was deeded to the church in 1868. 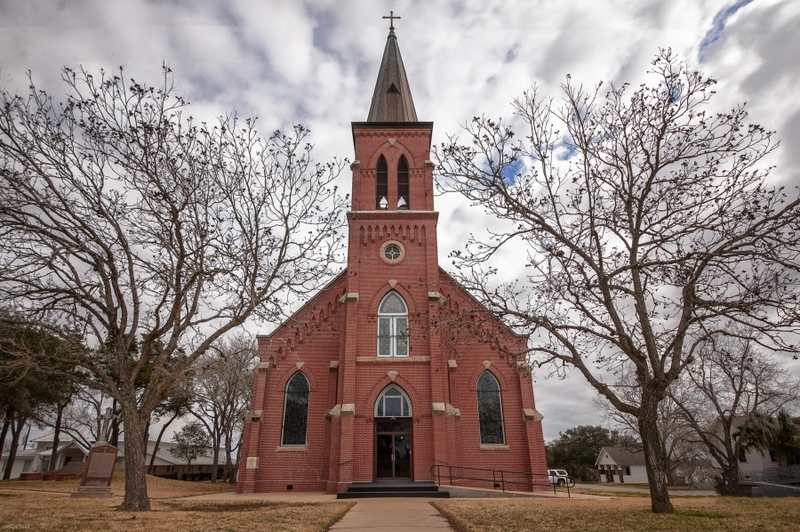 The current Nativity of the Blessed Virgin Mary Catholic Church is one of the first churches built by noted Texas architect, Leo M.J. Dielmann. It was build in 1906. Dielmann had just completed his architecture studies in Germany and designed a classic gothic revival structure. Many of the materials used were from the old church. 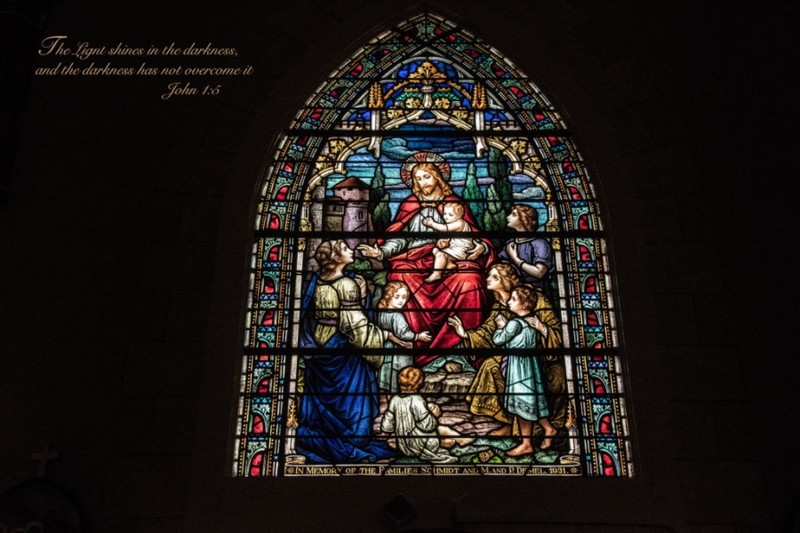 The original 18 stainless windows from the second church were placed into the present church. On September 8, 1906 , the new brick church of High Hill was blessed and the cornerstone was put in place. The final decoration, artwork and wall and ceiling decorations were note completed until 1912. Three bells from the second church were place in the bell tower and remain operational today. 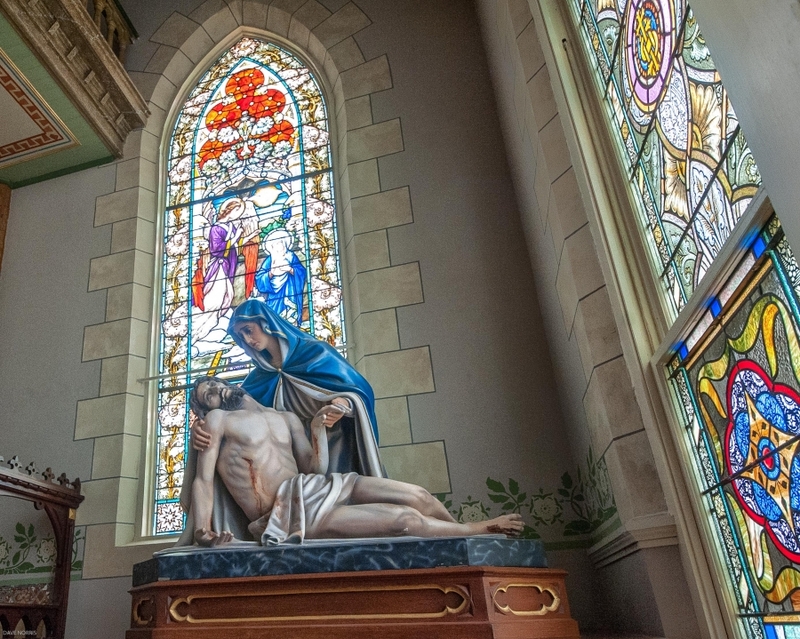 North of the present church is a amazing marble cross surrounded by cedar trees. The cross placed there in 1891. 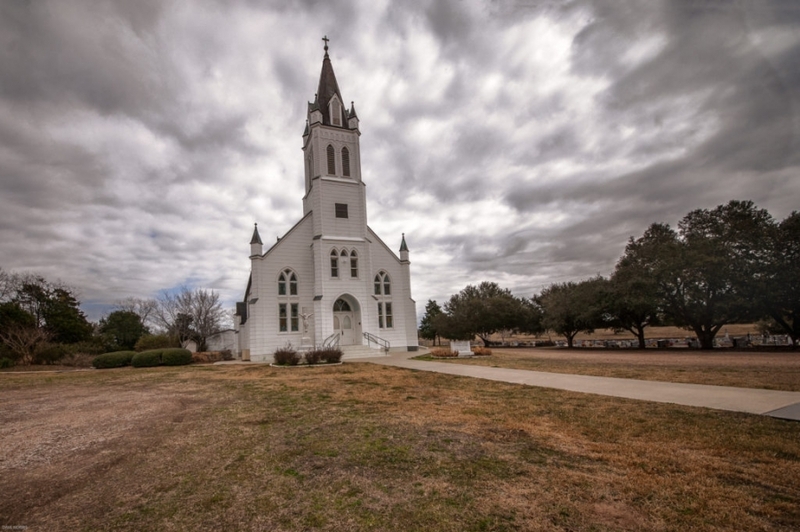 High Hill, Texas is located on Farm Road 2672, three miles from Schulenburg, Texas. Ammannsville, Texas‘ roots go back to the 1870’s and is named after the first settler, Andrew Amman. Like many of the towns in the area the early settlers were German and Czech immigrants. In 1876 the first business opened and the town had a post office by 1890. St. John the Baptist Catholic Church was opened in 1890. This church was destroyed in a hurricane in 1909. A second church was built by Leo Dielmann, an architect from High Hill. This second church burned to the ground in 1917. Immediately the folk in Ammannsville began to plan and rebuild a third time. The third church was completed in 1919. This church was simpler than the earlier ones, the interior has wide open spaces. 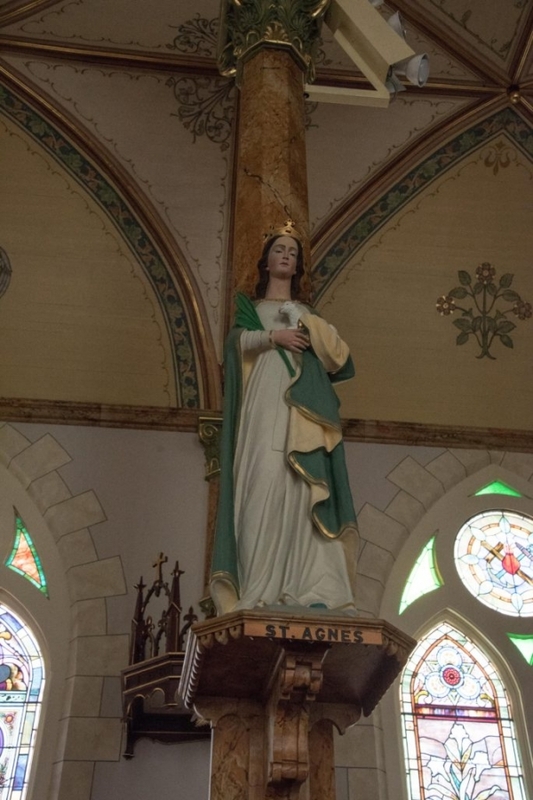 Six of the statues and a crucifix that had been saved from the fire were placed in the church. 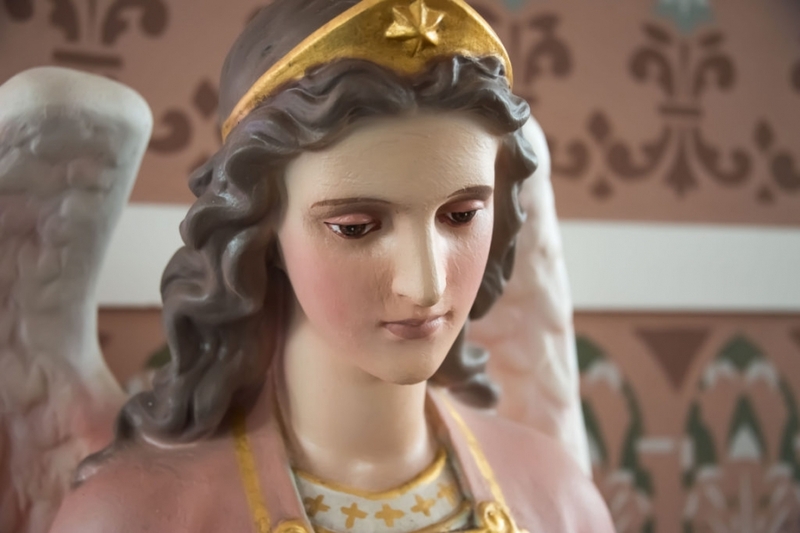 Fred Donecker, a noted decorative painter was hired to give some pizzazz to the church’s interior which is a dusty rose color. In the early days the women sat on one side of the church and the men sat on the other. The pews still have hooks where the men would hang their hats. Next to the church is a cemetery with artistic old ornate tombstones, many of which include Czech inscriptions. Many of the early settlers are buried here. There are still about 40 local residents today in the area. Most of the local activities revolve around the church and the KJT hall. 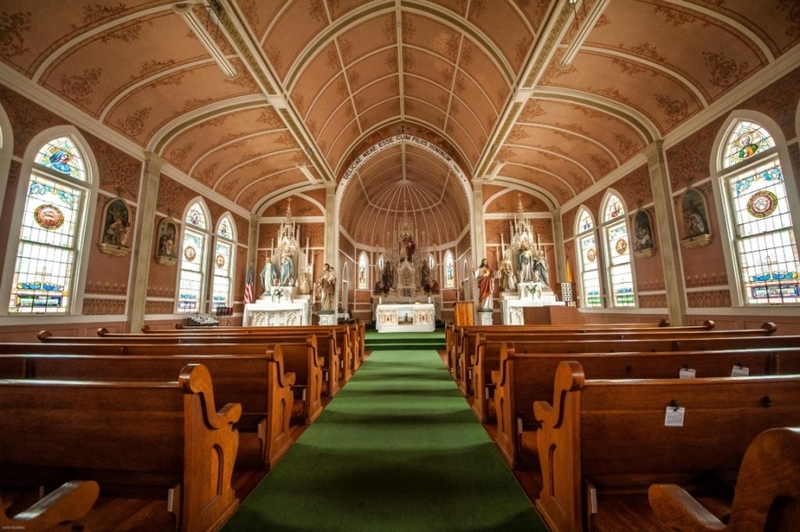 St John the Baptist Catholic Church and Ammannsville are reminders of a simpler time. Once a thriving community it is now a step back in time. 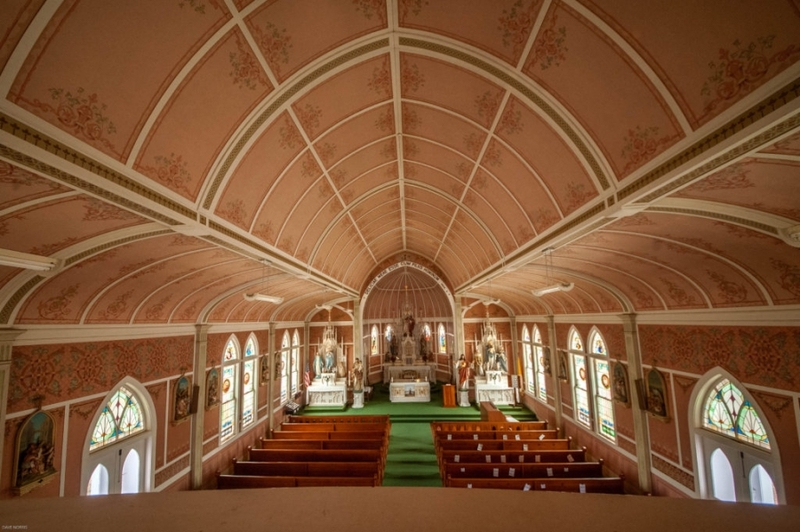 While touring the Painted Churches of Texas be sure and make Ammannsville one of your stops. In the 1800s Czech and German immigrants came to the Lone Star State, many settled in the central part of Texas. They named their towns after towns they had left in their homelands. Dubina, Texas is one of these towns. These settlers had a very strong work ethic, a great sense of community, and a strong desire to worship and pray together. 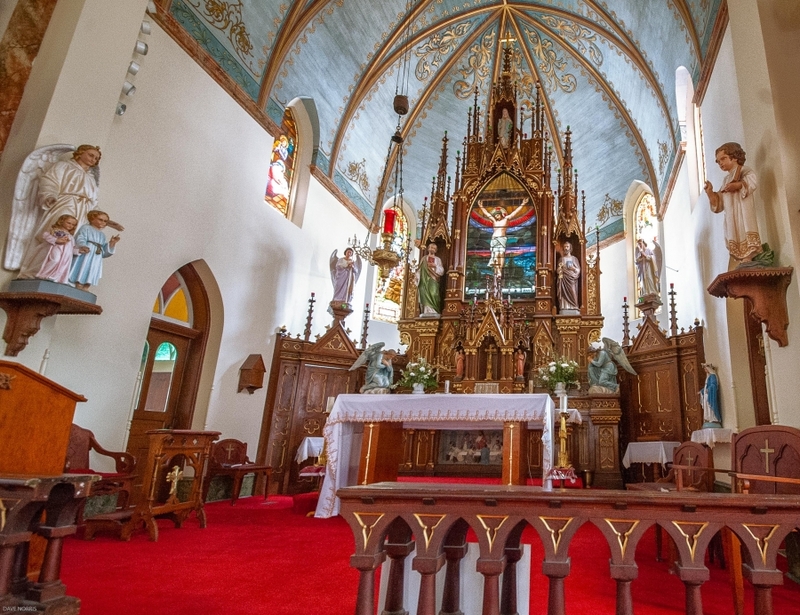 They purposely made their new churches feel like the ancient structures that they had left by painting the walls, alters, and arches of their new churches wooden walls in colorful patterns. 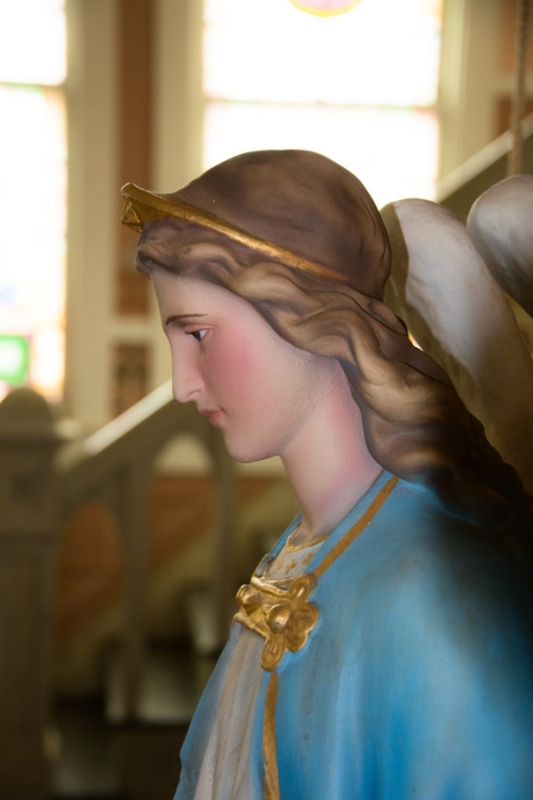 These churches became know as THE PAINTED CHURCHES. 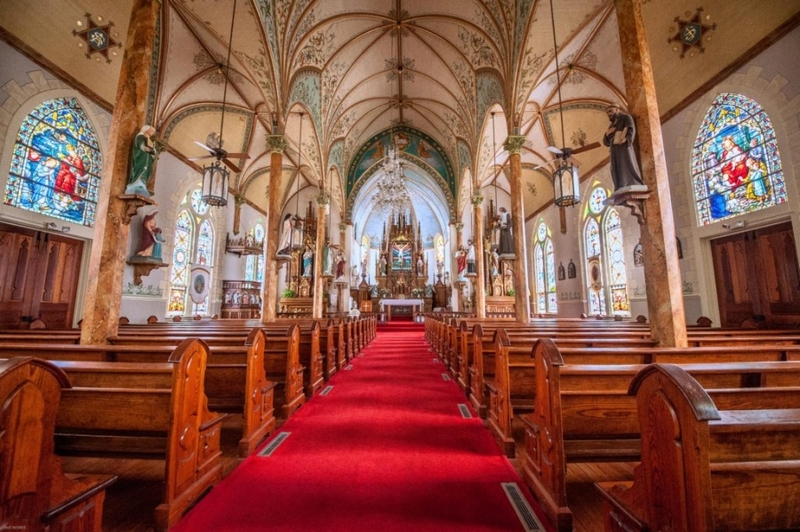 These churches have been preserved including St Cyril & Methodious Catholic Church in Dubina, Texas. 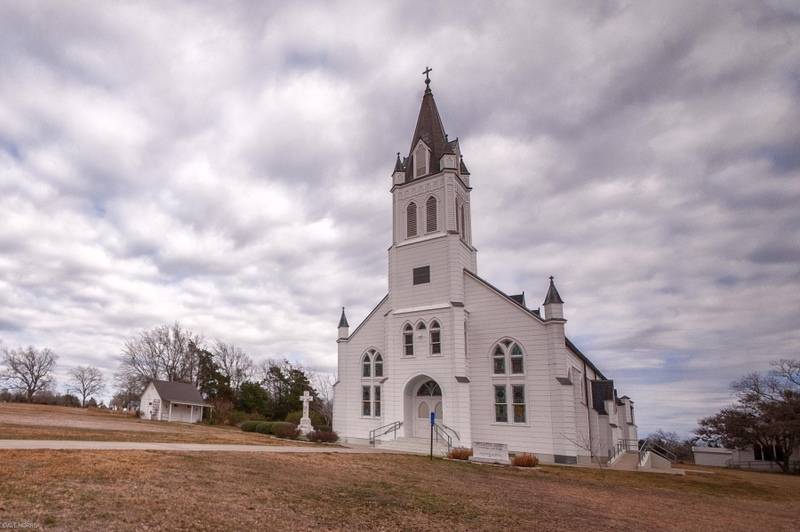 Dubina is known as the first Czech Settlement in Texas founded in 1856. The first recorded Europeans to pass through the area were member of the La Salle party in 1680. There are records that confirm that La Salle pasted within 2,000 yards of where St Cyril & Methodious Church is located. 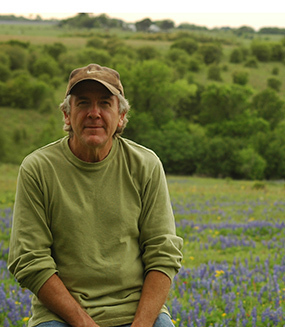 Dubina became the spiritual, cultural, and business center for this region of Texas. In 1877, St Cyril & Methodious Church was built. A freed slave, Tom Lee, built the cross on the steeple that is still on the church today. In the 1880’s there were more than 600 families in the parish. The church was destroyed in 1909 by a hurricane. 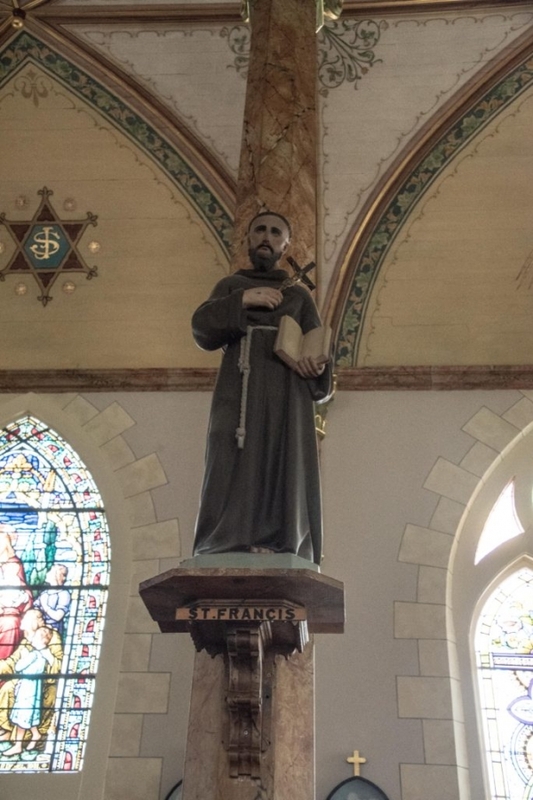 Immediately the people of Dubina began building rebuilding – in 1911 the current church was completed – including the iron cross that was salvage from the debris. The interior was painted with beautiful frescos, vines, oak leaves, and angels. During the 1950s unfortunately the entire interior was whitewashed. 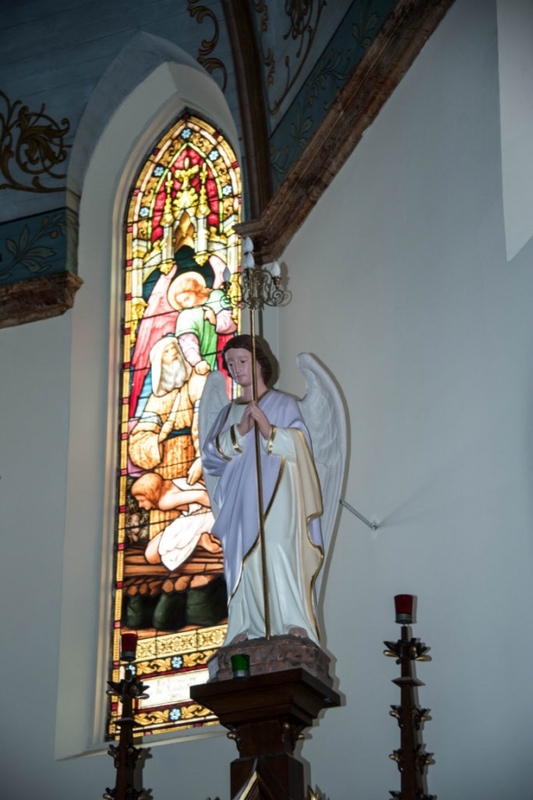 Fortunately in 1983 efforts, lead by Judge Ed Janeckas and Butch Koenig, began to restore the church interior. The original designs were uncovered during the renovation and restored using some of the original stencils. 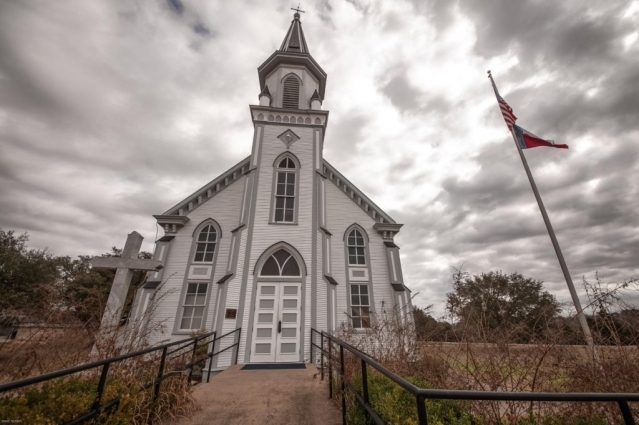 This church stands as a reminder of an important period of Texas History. These early settles had a strong faith in God which help them through many hardships as they settled in this new land. This church is open daily to visitors and is worth a visit. 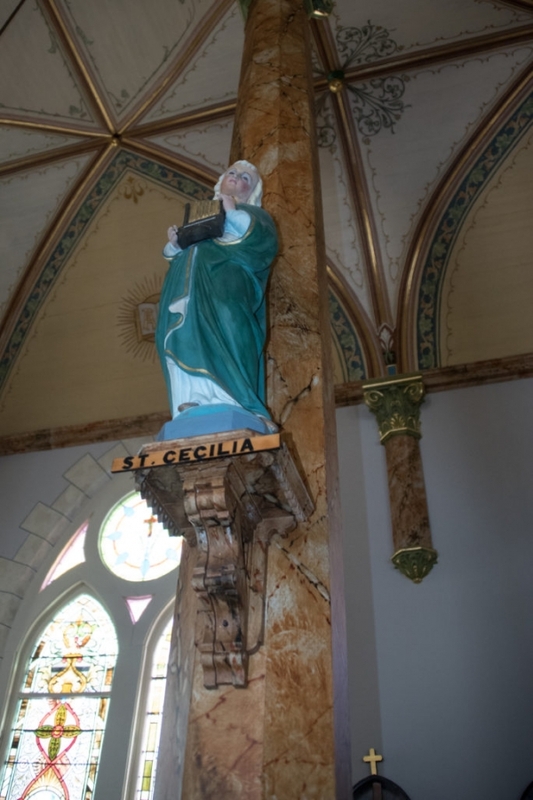 St. Cyril & Methodious Church is located off FM 1383, two miles north of highway 90.